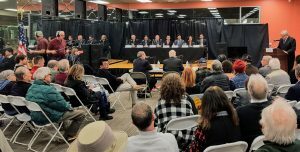 I spent the evening hosting a discussion among 7 of 8 candidates for California Assembly District 45, left open by the resignation of Matt Dababneh. Interesting answers, and a surprising standout. Thanks to the West Valley Chamber of Commerce, especially Diana Williams, our sponsors, Horace Heidt Estates, and Gaspar Insurance, Bob Blumenfield, and everyone who made this an outstanding event. I want to thank the West Valley Warner Center Chamber of Commerce, especially Diana Williams, sponsors Horace Heidt Estates, Gaspar Insurance, The Public X-change, and everyone else who contributed to an evening of interesting answers to hard questions and one surprising standout. The election is April 3rd, 2018.